Whether you are a beginner at meditation or more experienced, the retreat you’re looking for is probably already on our schedule: for one day, a weekend, a week or even longer. We offer retreats every month of the year, including during our intensive Summer Ango training period, when we observe the meditation retreat schedule five days a week for up to three months. 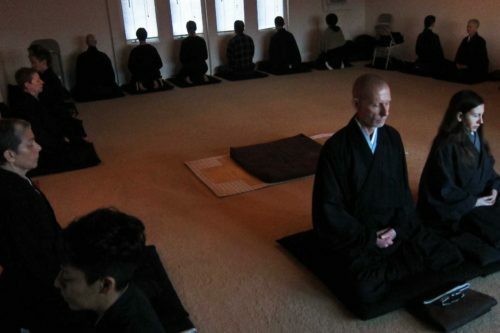 For people just starting out, our one-day Beginner’s Mind One-Day Retreats introduce shorter periods of zazen for those with little or no formal practice experience. A Zen retreat is called a sesshin, which means “gathering the mind.” A retreat setting such as ours gives you the strength of communal support and the encouragement of individual guidance. As a full-time participant you are provided with comfortable dormitory housing, flavorful and nutritious vegetarian meals, and compassionate one-on-one instruction. Everything we do during retreat – seated and walking meditation, eating, work, ceremonies and rest – helps to maintain daylong mindfulness. But that’s just the start. The peace of mind you realize during a retreat makes every part of your life go better. Instantly, you will realize the true benefit of Zen practice: to enhance the life you already have. Retreats are more powerful when participation is full-time. Because many people have work, school and family commitments, we welcome part-time and non-residential retreatants as well. 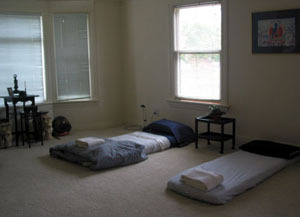 The cost of a meditation retreat, including meals and housing, is $60 per day for non-members and $45 for Hazy Moon members.